Market for automobiles is continuously changing with the advent of technology. With the growing industry trends there’s lot of scope for the professional dealers or sellers. But, lack of opportunities and less tech-friendly strategies have kept brick and mortar automobile dealers under the cover. It’s high time for them (professional dealers) to give their business a kick start with droom.in. India’s first marketplace to buy and sell new or used automobiles, Droom is changing the way to shop and sell new or used cars, motorcycles, scooters, and bicycles. Company offers truly 21st century experience in buying and selling automobiles. On top of everything Droom offers exceptional customer support and guidance, you won’t find anywhere else. 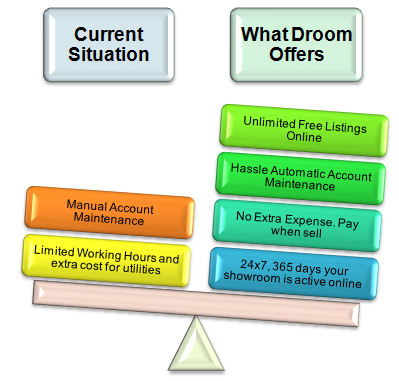 Besides, all these company helps you sell at best price providing outstanding discount offers like Droom Comes True, which is beneficial for both seller and buyer. So, redefine the way to sell used or new automobiles and increase your profits. You can download Droom android app to find out what’s more.